In the Disney Pixar film Inside Out released last year, adolescent Riley is sad, angry, and lonely after her family moves from Minnesota to San Francisco. She embarks on a plan to run away and buys a cross country ticket and boards a bus to go back to her former home. After her parents realize she is missing and discover she was not in school the whole day, they frantically start searching for her. At the last moment, as the bus is about to leave the city for the first leg of the long journey back to Minnesota, Riley changes her mind and makes her way back to her new house. When her relieved parents see her come through the door, they surround her with relief and questions. When she explains that she was trying to run away because she was sad and lonely and missed home, her well meaning parents ask Riley, “Honey, what were you thinking?” And Riley honestly and meekly replies, “I don’t know.” It is an amazing scene both for its poignancy and its truthfulness. There are times when asking an adolescent, “What were you thinking?” is questionable at best. And there are times when the response of “I don’t know” is truly the best they can do. So based on some of the most recent neuroscience on the adolescent brain, let us take a quiz together. True or False. We can refer to teenagers as “young adults” because their brain development is basically similar to adults. False. We know now that parts of the teenage brain are still getting organized and developing well into the late 20s. True or False. Teenagers make bad choices sometimes because their brain has less substance in self-control, planning, and problem-solving than adults. False. By and large, the substance of the part of the brain that is responsible for self-control, planning, and problem-solving (called the pre-frontal cerebral cortex) is the same as adults. The difference between the adolescent brain and the full adult brain is in the pruning, connecting, and the growth of the grey matter and white matter called myelin that assists in those connections. Adolescents’ connections are still developing. True or False. Teenagers stay up late because they require less sleep than adults. False. Every research study I have read says that adolescents actually require MORE sleep than most adults – optimally about nine hours. Further, neuroscience indicates that the brain is not resting during deep sleep. While in deep sleep, the brain is remembering the day and storing memories and even anticipating what is to come. True or False. The reason some teenagers seem emotionally over reactive at times is they respond to subtle emotional cues that most adults miss. False. Brain imaging studies show that most teenagers have less capacity to recognize anger or frustration in facial cues than adults. While the reasoning capacity of their brain is still developing, it appears that the emotional center of their brain (the amygdala) is as fully developed as adults so they can feel everything that adults feel, they just lack the capacity to reason. True or False. We can blame a lot of teenage mood swings on raging hormones. False. Puberty is beginning earlier (the most likely cause here is changes in diet and eating hormone-rich processed foods) and consequently hormonal output is peaking earlier – between 12 and 14 years-old. After that, hormones tend to start balancing themselves with less spikes and drops. The emotional mood swings many adolescents exhibit are again due to their fully developed emotional capacity and the lack of the ability to control and reason through these feelings. True or False. The teenage brain develops in a way that promotes impulsive and risk-taking activities. True. The brain circuits that lead humans to expect good things to happen to them develop earlier than circuits that allow people to anticipate the consequences of their actions. This means that many adolescents carry with them a sense of invincibility – what some call the superman or superwoman syndrome. They expect things to work out fine for them and are genuinely surprised when it does not. True or False. Teenagers are more at risk for addiction than adults. True. The probability of becoming addicted to a substance or behavior is greater during adolescence because the brain seems to react more positively to particular pleasure hormones such as dopamine and oxytocin and serotonin. Consequently, the adolescent brain craves these more than the adult brain and seeks to find ever increasing ways to stimulate their production. Therefore, adolescents need help regulating their behavior. True or False. Parents and stepparents do not have as much influence on teenagers because the brain prefers social cues from peers. False. While it is true that teenagers take more risks when they are with their friends, parents and stepparents continue to be identified as the single most important influence on teenagers’ attitudes and behaviors. True or False. You have the brain you are born with…period. False. The brain structure changes with experiences. Further, parts of the brain that are not used atrophy while connections in other parts grow and expand. Recent neuroscience research on victims of brain trauma demonstrate the brain’s remarkable ability to try to repair itself and rewire itself. So what is all this telling us about faith and the adolescent brain? Because the adolescent brain is still developing, it is remarkably malleable and open to developing the kinds of patterns in which faith in God can thrive and grow. Stories and storytelling are wonderful ways to help shape these patterns. Helping young people know the great stories of the Bible and connecting these stories to their own emerging story of faith is absolutely crucial. Relationships are vital at this age and the adolescent brain yearns for meaningful and trustworthy connections. Healthy relationships with peers and adults help wire the brain for healthy relationships for years to come. While reasoning is still developing, the adolescent brain’s emotional capacity is fully functional. So adult leaders must strive to create ways for teenagers to feel their way to faith. In the movie Inside Out, Disney Pixar demonstrated how five key emotions: joy, sadness, fear, anger, and disgust, form the foundation for everything Riley felt. Help young people with their feelings and use the ability to feel deeply as a way to deeper faith and belief. Give attention to ritual. Rituals are the framework for our believing and are thus key to making God personally meaningful and real. Develop rituals that help teenagers move beyond themselves to connect to God and repeat these over and over. Repetition of rituals embeds these practices in our bodies so that we return to them over and over as a source of healing and hope. A great resource about adolescents and the teenage brain is The Primal Teen, What the New Discoveries About the Teenage Brain Tell Us about Our Kids by Barbara Strauch (New York: Anchor Books, 2003). 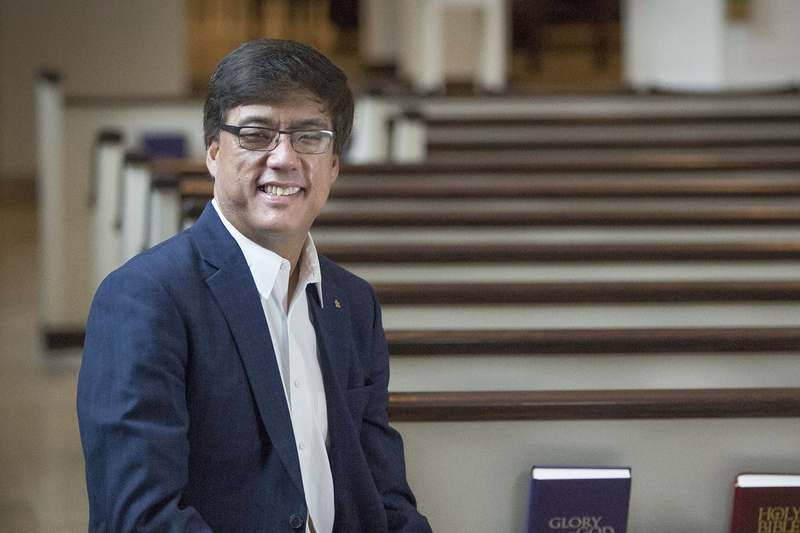 Rodger Nishioka serves as the director of Adult Educational Ministries at the Village Presbyterian Church in Prairie Village, KS. Prior to his joining Village Church this past spring, he served for 15 years as the Benton Family Associate Professor of Christian Education at Columbia Theological Seminary in Decatur, GA.